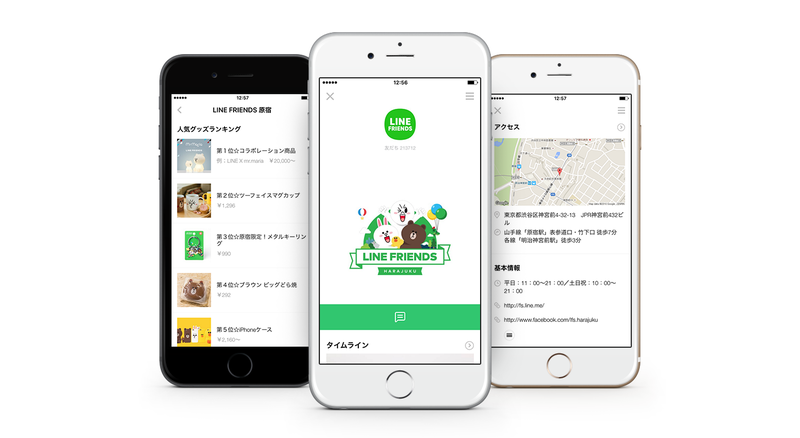 Tokyo, Japan – April 7, 2016 – LINE Corporation announced today that it has overhauled the account page features used by companies and stores with LINE@ accounts and LINE official accounts to create dedicated homepages within the LINE app. At the “LINE Conference Tokyo 2016” held on March 24, LINE announced plans for the strategic opening of the business platform on its communication app in order to make the wide variety of services provided by businesses over LINE more convenient, easier and more fun to use for users. As one part of this strategy, LINE is aiming to expand and diversify the features for companies and stores employing LINE and giving them new ways to lead users to their account homepages. *1: Starting in February 2015, account page features have been provided for LINE@ accounts and LINE official accounts for the creation of dedicated homepages within the LINE app. Notifications, event announcements, updates and other relevant information can be easily created and distributed in methods similar to standard web sites. *2: The renewed account page display will be automatically implemented for LINE@ accounts today, while displays for LINE official accounts can be modified using the Official Account Manager. *3: Rewards Cards and E-Commerce plugins only available on LINE@ accounts. LINE Table, HITOSARA and Review plug-ins only selectable for accounts registered in the cuisine category. Related Information plug-in is selectable only when info for the store is listed on related services (Tabelog, Hitosara and Ekiten). Advertisement plugin can only be turned off with paid accounts. Furthermore, LINE is enabling external partner companies to develop plug-ins, and starting today, reviews from Retty, Japan’s largest real name-based food review service, and menu information from Hitosara, a cuisine and restaurant site that displays the actual faces of cooks and food preparers, can also be optionally displayed. *4 LINE plans to continue its internal development and collaboration with external partners to increase and diversify the information and features that can be displayed on account pages. External parties interested in providing plugins can apply via the LINE Partner site (https://partner.line.me/en/partner/join). *4: Plug-ins will only be displayed on LINE @ Account Manager for restaurants that have information listed on both Retty and Hitosara . LINE will also provide support for Accelerated Mobile Pages＊5, fully overhaul the PC version of the account page, and provide a direct link to homepages via the LINE@ account profile pop-up to make it easier than ever for users to obtain information from companies and stores. *5: The Accelerated Mobile Pages Project is a collaborative effort launched by Google to create an architectural framework optimized for mobile that loads content at high speed.